We review the popular IQAir HealthPro Plus air purifier. Along with the overall description of the unit, I run it on three different settings so you can get an idea of how quiet the unit is. 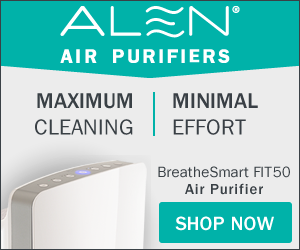 Before you invest in any air purifier/filter, I strongly recommend that you watch this video so you can get an idea how the IQAir unit functions and how it can solve your air quality issues. Hey, everybody. As you know, air quality is a big concern of a lot of people. Probably for you, if you’re watching this video. Lately, we’ve had a lot of customers come in looking for a high quality air purification unit. They may suffer from allergies, or they might just want to live a healthier life and breathe cleaner air. There’s an awful lot of obviously pollen, awful lot of various kinds of particulate matter floating around in the air. All the way down to very, very small and fine particles, and there was recently a study that talked about how dangerous these very fine particles are. What I want to talk about, both for people who have allergies and those who just want to get rid of odors in their home or office or for those who just want to live a lot healthier life. I wanted to walk through the IQAir HealthPro Plus. IQAir, made in Switzerland. Certainly, one of the top units on the market today, maybe the top for a portable type unit that you can just place into your home. The HealthPro Plus features four stages of filtration. Unlike a lot of their competitors, they bring in the air from the bottom of the unit. You think about all those particles floating around in the air. They’re all going to ground eventually. A lot of them are obviously going down towards the floor and towards the lowest surface that they can go. The IQAir unit is actually sucking those in. Sucking in, what I would say, a more denser air mixture of particles. That air is brought up through the unit, goes through four stages of filtration, and then it’s exhausted. The clean air comes out through the top of the unit, all the way around. Almost 360 degrees blowing out that clean air into your environment. The filtration stages, there’s a pre-filter that gets out big particles like pollen, pet dander, hair, that sort of thing. The second level of filtration in the HealthPro Plus unit is activated carbon. Carbon has been used for lots and lots of years. This unit here has five pounds of carbon. That takes out a lot of the odors out of the air. Carbon has been a really traditional means of cleaning your air. When you have a big cell of carbon going through, not just a mesh coated with carbon, it really eliminates all those odors in your air or most the odors [inaudible 0:02:43]. There is a chem absorption layer of filtration. That takes out chemical smells. It can take out formaldehyde. It can take out other chemical type of things. Then, what IQAir terms as a hyper HEPA filter. I’m sure you’ve heard the word HEPA. There are different levels of HEPA, but generally HEPA filtration is units that can get out particles that are .3 microns or larger. IQAir really takes that to the next level. They’re taking out particles that are .003 microns or larger. With that kind of HEPA, you’re getting the fine particles out that are floating around in the air that can really cause some serious health problems. I wanted to do a little demonstration here. A lot of folk are worried about how loud these are. With the new addition IQAir, it’s an extremely quiet unit. There are six different fan speeds. I’m not going to go through all six of these, but I will go through three. I’ll go through the lowest, the mid-range, and then the highest. It is a little bit difficult to capture sound like this on video. That’s why I’m not wearing a mike like I usually do. Instead, I have a microphone set up in front of us. Hopefully, we’ll capture this pretty well. Let’s go for the lowest setting. I don’t know if you could really hear that. I really didn’t hear much. The lowest setting, obviously, isn’t moving as many cubic feet of air as the higher settings. Let’s try the mid-range setting. You will be able to hear this, if you didn’t hear the first one. Lastly, of course, I’ll put on the highest level. After I do that, then I’ll tell you how you actually use these levels on a normal basis. On that highest level, you could hear it. You probably wouldn’t want that running all the time, unless you want some white noise or something in the background when you’re trying to sleep. It is loud. It’s not really disturbing loud. It’s not like there’s bells going off. It’s just kind of a white noise in the background sort of thing. Typically, you won’t need to run the unit at that high of a level. What I usually do, and actually what we did here in this video studio overnight, is you run it at the highest level for 12 hours, 24 hours. You get out most of the particulates in the room, and then just run it on a maintenance setting. Just run it on either the lowest or second to lowest just to keep the clean air … or to keep the air in the room clean. You’ve already gotten rid of the bulk of the stuff in there. Certainly, it varies from environment to environment to environment. As you could hear as I ran the lowest and even the middle setting, it’s really not disruptive if you’re watching TV or reading a book or sleeping. It’s certainly not a disruptive. It’s certainly not a loud sound. I really appreciate the quietness of this unit, but I also appreciate that there’s an option where you can crank this thing up and really change over the air in a room very quickly. There’s also a comprehensive set of controls on the HealthPro Plus. With this unit, you are able to set up a timer to go off certain days of the week, certain times to run the air. You can run it on higher levels when you’re not home, for example, so you’re not listening to it. It also has the filter life, which is based on hours of operation. There is, the IQAir HealthPro Plus. We’re going to be doing a lot more air purifier videos. We already have a couple on the channel now. If you like, I’d sure appreciate it if you would subscribe to the channel. It’s the IQAir HealthPro Plus. I really say you can’t go wrong with this. I’ve used these in the office, used these in the home. Visit us Amazon’s IQAir Category for more information about the entire line of IQAir. Everybody, have a great day.